Week 9 is done and we are down to the final week of regular season matches! 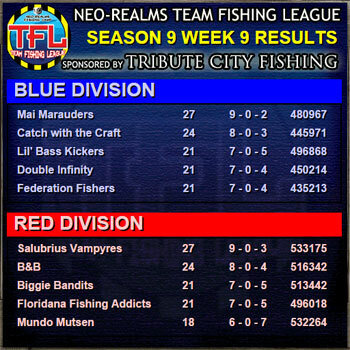 Week 8 is in the books and Mai Marauders and Salubrius Vampyres still holding on to their leads in the Blue and Red Divisions respectively. The regular season is winding down but even teams down the table may have a chance of qualifying for the playoffs if they go on a late win streak! Good luck to all teams this week! After week 7 we have 2 clear teams at the top of each division, holding on to a 3 point lead! 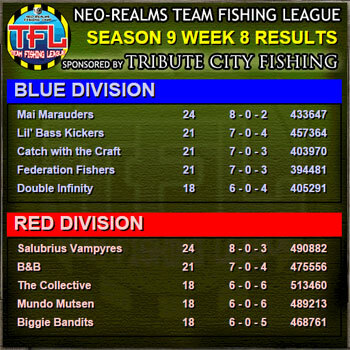 In Blue Division: Mai Marauders tops the list, while in Red Division Salubrius Vampyres holds on to their 3 point lead. It's still extremely close in both divisions! We're past the halfway point of regular season and it's still very close in all divisions! 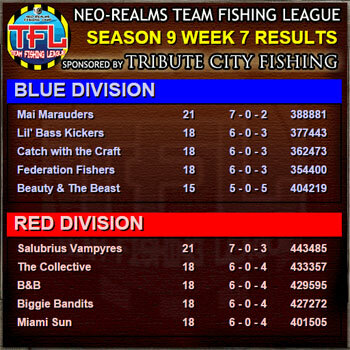 In Blue Division: Lil' Bass Kickers is up on total points with Beauty & The Beast, Mai Marauders, and Catch with the Craft all with 5 wins. 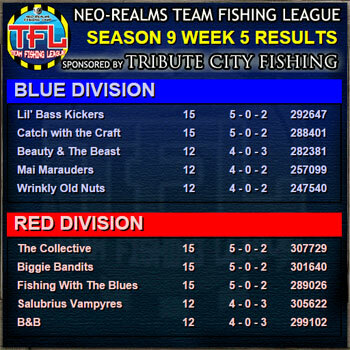 In Red Division: Biggie Bandits has a 3 point lead with Salubrius Vampyres, The Collective, Heavenly Swamp Rats and Fishing with the Blues only one game out. 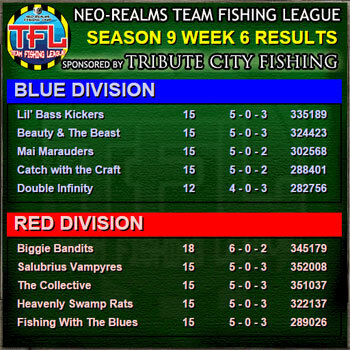 After Week 5, Lil' Bass Kickers hold on to a narrow lead over Catch with the Craft on points in the Blue Division, and in Red Division The Collective holds on to a narrow points lead over a three way tie on matches with Biggie Bandits and Fishing with the Blues.